"Making connections, one theatre style at a time." Synthesize and present in speech and visual images the essence of what you have learned and developed through the practical applications (performance and production aspects) of this course thus far. The images that accompany your presentation must communicate an experience of experiences of learning by doing. 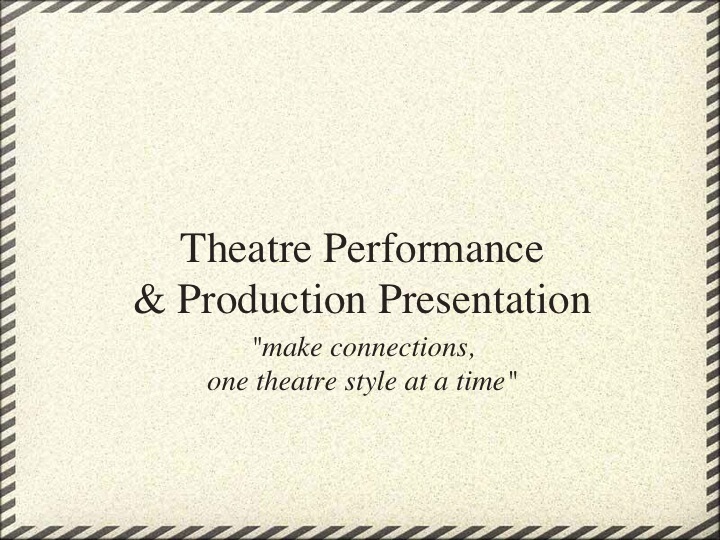 The presentation will be exciting and dynamic as the student discovers a voice that will reflect a sensibility, a way of seeing, of doing and of reflecting on theatrical action through the course. 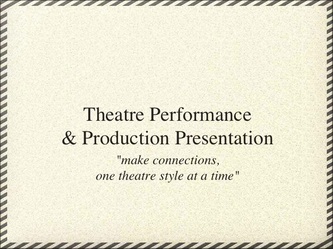 Your presentation should be about your experiences - what you have tested and contested through the experience of doing and making theatre, of watching theatre from your own, work of others and other cultures? What have you applied in your own practice and the testing of a theory by the application of it in your own work. and the work of others. 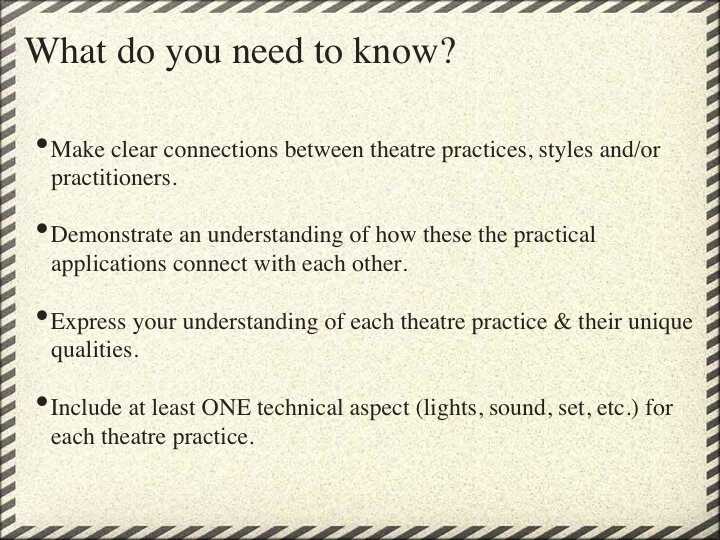 Your EXPERIENCES in practically experimenting with skills and elements is paramount to the success of this assignment. How can a decision about lighting affect the presentation of a character on stage? How can immersion in the world of Physical Theatre transform the self-conscious and stilted student of acting into a physical communicator on stage? Does Stan's theory and philosophy affect the audience? Can you challenge or prove his practice? How can a production radically alter your/an audience member's perception of what is possible in theatre? 3. The presentation must not simply be a reading from, or repetition from memory of, the notes prepared beforehand. Regard the presentation as a performance, to communicate passionately and convincingly and to speak from personal commitment. 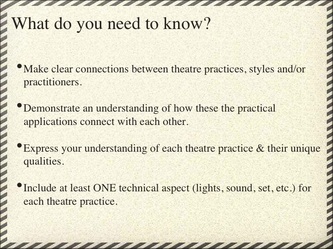 Your presentation should not be sectioned by units, it should be by connections made between practices/styles. 4. Images: Make sure the images are not a literal representation. Use your imagination. Find images that represent what you saying figuratively. Presentation must be accompanied by a set of 3-6 images to illustrate or counterpoint the spoken word. 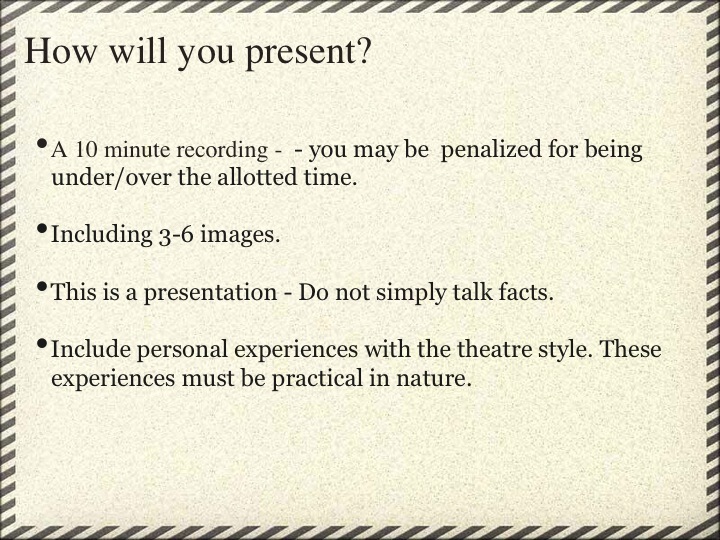 A 10 minute recorded audio presentation. 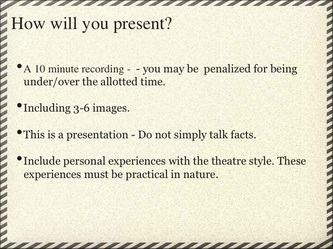 Make sure your presentation is in mp3 format OR Keynote/Powerpoint with an audio recording embedded. Please email your file to your teacher by the due date.